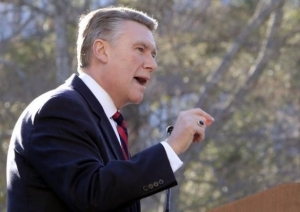 A new report from The Charlotte Observer suggests Mark Harris — the presumed winner of this year’s U.S. House District 9 race — knew and recommended the embattled campaign consultant at the center of the voter fraud scandal. The newspaper published a story this afternoon that digs into McRae Dowless’ background, which includes a felony conviction in 1992 for fraud and perjury. But perhaps the most interesting segment suggests that Harris, a Republican from Charlotte, once recommended Dowless’ services to another candidate. Questions about Dowless and the handling of absentee ballots in District 9 derailed the certification process for that election, which Harris appeared to win last month by about 900 votes. It’s unclear what happens next in the stalled election. “He was an independent contractor who worked on grassroots for the campaign, independent of the campaign … as he’s done for a number of campaigns over the years,” said Andy Yates, Harris’ top strategist and the founder of Red Dome Group. In 2017, Republican businessman Pete Givens launched a campaign for the Charlotte City Council seat in District 2, traditionally a Democratic stronghold. Turnout for off-year City Council elections is usually in the low single-digits, so Givens said he decided to try a different strategy. If people wouldn’t show up on Election Day, maybe they would vote for him via absentee ballot. Asked if he would have done that, Givens responded forcefully. Across the 9th district, which stretches from Charlotte to Fayetteville along North Carolina’s southern border, 24 percent of the requested mail-in ballots were unreturned. In Robeson County, 64 percent of mail-in ballots requested did not make it back to elections officials. In Bladen County, the figure was 40 percent. The unreturned ballots are disproportionately associated with minority voters. More than 40 percent of the ballots requested by African Americans and more than 60 percent of those requested by American Indians did not make it back to elections officials. For white voters, that figure was just 17 percent. In Bladen County, the breakdown for African Americans and American Indians generally reflected the district-wide figures. But in Robeson County, 75 percent of the mail-in ballots requested by African Americans and 69 percent of the mail-in ballots requested by American Indians were listed as unreturned. In other counties hard-hit by Hurricane Florence, as Bladen and Robeson were, the share of unreturned mail-in ballots was not as high. In Columbus County, 29 percent of the mail-in ballots requested were unreturned. In Pender County, the figure was 18 percent.